I tried for years to find the name of this pattern. A kind gentleman informed me it is called Marine Fantasia and usually in green and chartreuse. 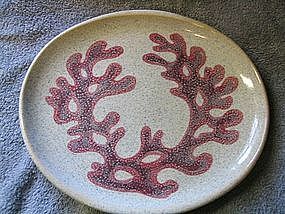 This platter is in a secondary color. The design has always reminded me of a stag's antlers. It measures approximately 11 3/4 inches by 10 1/2 inches. No chips, cracks or breaks. I need your zip code to calculate the postage.